Want to know just how much fun it's possible to have in a ferociously fast small supermini? 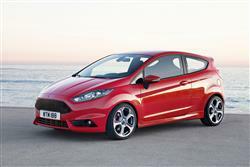 Then try one of these - the post-2013 generation version of Ford's Fiesta ST. It's been developed like a proper performance car - and drives like one, ready to paint a smile upon your face corner after corner. Of course, for not much more than the affordable prices being asked here, you can possibly buy more power. But after a drive in one of these, you probably won't want to. Before 2013, it was true to say that we'd never really had a truly great sporting Ford Fiesta. The Blue Oval brand had tried of course, building up a hot hatch legacy around this model that went all the way back to the XR2 of 1981, with a history subsequently embellished by the more powerful RS1800 and RS Turbo models that followed it. All though, were eclipsed by French hot hatch rivals, first a series of small Peugeot GTis, then in more recent years, the Renaultsport Clio. The post-2013 generation Fiesta ST we're looking at here was tasked with changing all that. It once again had to take on ever more sophisticated versions of those same two rivals, along with a whole host of other similarly powered shopping rockets offering anything between 170 and 200bhp. In short, it had to be good. It was. Which was predictable in some ways. For one thing, it was based on the best-handling supermini of its kind - which certainly helped. For another, Ford had an awful long time to get it right. The sixth generation Fiesta this particular ST is based on dates all the way back to 2008, but it was the Spring of 2013 before this, the first of the properly quick versions, hit the market. Unlike its rivals, the Blue Oval has not one but two performance badges up its sleeve when it comes to cars of this sort, 'ST' (or 'Sports Technologies') being company-speak for 'quick but not concussive', a performance level that sits just above fast-but-family-friendly 'Zetec-S' models but just below track-spec RS derivatives. A badge, in other words, promising mild madras rather than vindaloo and one applied to the kind of car a red-blooded racer could enjoy but still use every day. Designed by enthusiasts to be driven by enthusiasts, this fast Fiesta's proved to be poised, priced to sell and, with 182PS on tap, plenty quick enough. It provided to be the best car of its kind that Ford had ever brought us. An ST200 version was launched in the Autumn of 2016. And both ST and ST200 variants sold until mid 2017, after which they made way for an ST version of the replacement seventh generation Fiesta. It's easy to go overboard and get all Max Power when it comes to a car of this kind, a temptation Ford thankfully resisted here. This isn't the prettiest junior shopping rocket you can buy but it is playfully purposeful in demeanour, the business end dominated by a black honeycomb mesh version of the facelifted sixth generation Fiesta's distinctive Aston Martin-like trapezoidal front grille. It sits below a sculpted bonnet and just above a deep chin spoiler, both of which set the tone for a sporty three-door-only silhouette that's clothed in a unique ST bodykit. Design that's especially purposeful at the rear with its roof-top spoiler and lower diffuser through which peep a pair of chromed dual exhaust pipes. Things aren't quite so overt once you take a seat inside. Go for a base-trimmed version and you don't even get the two things that most set the cabin apart - the (rather hidden) steering column starter button and the lovely, grippy Recaro seats you get on the plusher ST2 model. Other ST-specific features are a little more subtle: there's alloy trim for the gearlever and pedals and ST badges on the steering wheel and front door scuff plates. Oh and the traction control function - which in lesser Fiestas would be hidden in one of the infotainment system's sub-menus - is given its own prominent position on the centre console. Otherwise of course, apart from a different colour scheme for the heavily-cowled instruments, it's all normal Fiesta-fare - which means that it all works fine but doesn't feel of super-high quality. If you've an issue with that, then bear in mind the affordable pricing. Generally, we find that we're happy with it all the way it is, though the multimedia screen that dominates the dashtop could be a bit larger. There are no complaints about the shiny Sony-branded stereo you get on plusher models though. Plus it's nice to get a properly round (rather than flat-bottomed) steering wheel in this class of car for a change - and the leather-trimmed three-spoker feels great to hold. And rear seat space? Well, it's better than the claustrophobically rising beltline of this three-door-only design might lead you to expect. True, the heavily bolstered Recaros do slightly hinder your access into the back, but once you're there, the Fiesta surprises with headroom manageable even for a six-footer - though his or her legs will be crushed pretty snugly against the seat in front. Luggage room meanwhile, is much more class-competitive than that of the larger Focus model, though the 276-litre total is a fraction down on rival Peugeot 208 GTi and Renaultsport Clio models. If that's not enough, you can of course push forward the rear bench and although, because the backrest simply flops onto the seat squab, that doesn't give you a completely flat floor, it does free up 960-litres of fresh air. Prices for the post-2013 generation Fiesta ST start at around £8,300 for an early '13-era 'ST1'-spec car, rising to around £14,000 for a later '17-era model. There's a premium of around £400 for plusher 'ST2' spec and a premium of around £1,100 if you want top 'ST3' trim. The top ST200 was only launched in 2016 and sold for just a year. Prices range from around £14,500 to around £17,500. Make sure that the car you're inspecting is straight, in terms of all the panels lining up with no gaps; and that the panels have an equal distance between them for the length of the panel join. Check the fitment of the exterior trim like the lights, bumpers and door mirrors etc. Make sure they've not been damaged and/or badly replaced. Check the paintwork for dull patches, which means it could have had touch ups at some point and the repair isn't of good quality. It is common on the Fiesta ST to have stone chips on the front bumper and bonnet and these could provide a point of negotiation. Check for kerbing damage to the wheels which not only looks awful but could also be a sign that there may be suspension damage or that the steering geometry is out of alignment. Be suspicious of cars with black-painted alloy wheels; this wasn't a standard Ford colour and owners sometimes apply to hide kerbing damage. The standard fitted tyres from the factory were Bridgestone Potenza RE050A's. These should last a while but it all depends on the driving style of the owner. If you go to view a 5000-mile car and the front tyres are a make other than these, then they may have been having fun.. Which means they've not only worn the tyres out, but possibly other components. If the tyres have been worn out due to the driving style, then it's worth also checking the suspension and steering components for wear. If the car has had its right height lowered, then the tyres would theoretically wear out quicker if the steering alignment isn't correct. This would wear the inside edge of the tyres out, so put the steering on full lock and check for this. Red brake callipers mean you are looking at a car with the Style pack fitted. A car without the style pack comes with plain silver callipers, or brown/dirty if it's an older car as they deteriorate with time. The red paint can withstand a lot of punishment but very high temperatures can discolour the red paint. This means the brakes have been very hot, and driven in a manner to create the heat. Possibly track days or enjoying country lanes a lot. Check that the brakes are all working. Slowly move forward and pull up the handbrake gently to see how far the handbrake lever travels and you should feel the rear of the car dip down. If only one side dips down, then the opposite side brakes could be seized. This would fail an MOT and can be costly in parts. You should also be able to feel any imbalance in the brakes, or 'warping' as it's commonly known. This is a result of heavy or prolonged braking, generating heat, then keeping the footbrake applied while stationary. Hs is commonly initiated going from motorway speeds, down to a stop. Or by going for a blast around the country lanes. With warping comes over heated brakes, which will feel very un-responsive and could squeal at low speeds when braking. If the handbrake handle is travelling quite high, it could mean the rear pads are getting low, so it's worth checking. But the handbrake lever can be adjusted to lower it down. If the engine bay has been steam cleaned ask why. It's not normal practice to do this when selling a car, unless something is trying to be hidden. Check underneath the engine for any drips or leaks. If you are at the private seller's address, ask where they usually park the car and look for signs of leaks on the ground. Check all fluid levels before starting the car and it's best to view the car when the engine is cold. This way you get to hear the engine as it would sound when you start it up every morning. You don't want a noisy engine. If the engine is warm as you arrive to view, it could be hiding a cold start issue or a rattle/noise. Either feel the bonnet for warmth or check the temperature gauge on the instrument cluster. Check in the engine bay for any signs of crash damage. Check that all the front end pieces are secure and not loose; the grilles, bumper, front panel, headlights etc. Check the retaining screws/bolts for signs of tampering, meaning that they have been removed at some point. Check that the air conditioning works. Check that the seats move, recline, raise and the general condition for wear and tear. Also that the seat belts pull right out and retract by themselves. Along with checking that everything inside the car works, check the radio and satellite navigation functions. Check the DAB function on the radio, as this has been a problem in the past for not working on some units. Have a look underneath the car all around to make sure nothing is hanging down or any debris is present. Give the exhaust a wobble to make sure it is secure and the mountings are present. If the exhaust has excessive movement, this could indicate the mountings are worn, possibly relating to worn engine mountings or exuberant driving styles meaning everything is moving too much. The same can be said if you wobble the exhaust and you can hear it knocking or banging against the under body of the car. Check for marks where you would put a trolley jack on the under body, then question the seller as to why the car has been in the air, possibly for modification or repair work. It is also worth getting an HPI report to see if there are records of the vehicle being damaged or written off. For a small fee it is well worth it, as the seller could be hiding something about the car and it's just not worth taking the risk of not checking. If the car has been written off or accident repaired, the front page of the V5-log book will show this at the bottom of the page. This means that the vehicle is recorded as such and will forever be on file for the car. This decreases the value of the car and you are best off going to find a non-damaged car, as there are plenty out there. And overall? Well if there are issues, then weigh up the hassle of rectifying them. If that's prohibitive, walk away. There are plenty of other examples of this model there. (approx based on a 2014 Fiesta ST - Ex Vat) An air filter costs around £12-£15 and an oil filter costs around £6. Brake pads sit in the £15 to £25 bracket for a set, though we also found pricier branded items costing around £40. Brake discs can be as affordable as around £25-£38, though we found pricier branded items costing around £65 or even in the £84 bracket. Wiper blades cost in the £6 to £10 bracket. Try not to damage the rear lamp cluster; a replacement unit costs in the £50-£70 bracket and a headlamp is even pricier, costing in the £83 to £90 bracket (though we did see these listed for as much as £180). A timing belt costs in the £56 bracket, though we found pricier branded items costing around £130. A spark plug can be had for around £10 - but pricier brands can charge around £23. A shock absorber is about £100. It isn't often with a small hot hatch that the engineers get things absolutely right. Either compromises are made for day-to-day usability that rob you of that last ultimate enth of response when you're really pushing on. Or you get a race-bred rocket that loves a smooth circuit but is so firm that it simply gets on your nerves in everyday motoring. With this ST, the balance between these two extremes is as good as it's probably ever going to be. As for why - well let's get down into the detail. You realise that there's something special about this car after the first 30 seconds of driving it. It's a little firmly sprung, yes, but bearably so and there's a terrier-like feel to the way it just wants to go, straining at a leash controlled by your right foot. Pricier, pokier hot hatches dilute this eager appeal with modern technology - paddle shift transmissions, four wheel drive, electronic damping systems. Here, there's none of that - which isn't to say that hi-tech cleverness is entirely absent. On the contrary, things moved on quite a bit with this generation model over what was provided by the previous 2.0-litre Fiesta ST that was launched in 2005. For a start, the engine here is one of Ford's newer generation EcoBoost units, able to deliver more power from lower capacities that develop more efficient emissions. So the previous generation design's 2.0-litre unit that put out 150PS is here replaced by a 1.6-litre engine developing 182PS. Which is impressive, but still not quite up to the 200PS level offered by both this model's closest two rivals, Peugeot's 208GTi and the Renaultsport Clio 200. Or at least it is on paper. In practice, there's no difference at all thanks to the fact that this Fiesta's has an overboost function enabling it to deliver 200PS for 15 second acceleration bursts, just when you want it. That's why its 0-62mph sprint time of 6.9s is virtually identical to that of the two rivals we've just mentioned. The top speed of 137mph isn't too far shy either. So lack of power to properly compete at the top of the junior hot hatch sector isn't actually the problem you might think it would be. Quite the opposite actually. Mountune, the people who engineered the Ford GT supercar, developed a factory-approved engine pack that, for only a few hundred pounds extra on top of the new price, increased the output to 215PS and boosted pulling power from 290 to 320Nm, enough to shave nearly a second from the all-important 31-62mph 4th gear acceleration increment: with this pack fitted, it's improved to just 5.7s, which is quick enough to seriously bother far more powerful hot hatches from the next division up. Look out for cars kitted out with this option. Ford also introduced a 200PS ST200 variant to the range towards the very end of this ST's model life, a derivative that also featured changes to the steering, dampers and anti-roll bars, plus some re-programming in the ESP system. Whatever your choice of ST variant, power of course is nothing without control - which is exactly where this Fiesta really shines. The suspension features stiffer springs and has been lowered by 15mm: just enough the wring the most out of what is already a brilliant chassis and deliver a level of cornering poise that makes the rival Peugeot, for one, feel a bit soft and compromised. This little Ford's been described as the 'anti-supercar driver's car' which means, essentially, that day-to-day in the real world on real public roads, you'd probably have more fun in one of these than in something seriously exotic. The reasons why really speak of the depth of development that's gone into this ST. Take the beautifully slick 6-speed manual gearbox for example. Or the all-round disc brakes (a Fiesta first). And all these elements were honed to perfection by hundreds and hundreds of tyre-squealing kilometres around the fearsome Nurburgring Nordschliefe racetrack in Germany. That's where they got the steering just right. Even though you don't get a variable ratio set-up like that fitted to the larger Focus ST, brilliant reserves of feel and a faster-ratio rack make this one of the very best electric set-ups we've tried. And it's where particular efforts were diverted towards the clever eTVC torque vectoring system that lightly brakes the inside wheel as you turn, transferring power to the outside wheel where grip is needed and enabling quite astonishing mid-corner speed that fires you from bend to bend. You don't feel it happening: you just point, plant and go. And feel like a better driver than you probably are. I've found that all the very best sporting cars flatter you in that way. Torque vectoring continues on even if you want to be a bit of a hooligan and turn the electronic stability programme either partly or fully off so that the back end starts swinging about when you lift off and brake. A neat MyKey function enables you to disable this option should you lend the car out. We know we would. It even lets you restrict the volume of the stereo - which you ought to be doing anyway because the engine sounds so good. That's courtesy of a clever 'Sound Symposer' system that filters the most attractive noises from under the bonnet and delivers them into the cabin under hard acceleration when you want to hear them, a stimulating soundtrack for a stimulating drive. After three decades of trying, Ford at last assumed market leadership in the junior hot hatch segment with this post-2013-era Fiesta ST. It was a best seller on merit. This really is a special little car, usable every day but as focused as you could want when your favourite road opens up and you can flex your right foot, sink into the grippy Recaros and dial up a responsible amount of red mist. We'd also honestly say that it's pretty much the only car in its segment that's ultimately rewarding enough to consider taking on a trackday. Which, we think, says everything, the difference, if you like, between a supermini with skirts, spoilers and a more powerful engine - and a properly developed performance car. Which is what this is, as much a go-to choice in its market sector as a Porsche 911 would be if you were looking for a performance sportscar or a Lotus Elise might be for those in search of a Roadster. In all honesty, you'd have more fun in this little Ford on a public road than you ever could in something pricier and more powerful. Think of it as one-up for the common man, small perhaps in price and performance but big in smiles per mile. Which, at the end of the day, is exactly what a hot hatch should really be all about.